I’m going to admit up front that I have a bias against Typhoon. When I was there, we had just had some of the best Thai food in the country at Lotus of Siam in Las Vegas, and now, 3 weeks later, my memories of Typhoon are all running together. Now that everything is out in the open, here are my impressions of Typhoon. When you first walk in, you’ll notice that Typhoon is a trendy restaurant full of trendy people. On the plus side, it’s a classy level of trendy, not those dirty looking hipsters and hippies on the street. Another plus is that they have a pretty large menu, and a rather extensive tea menu. 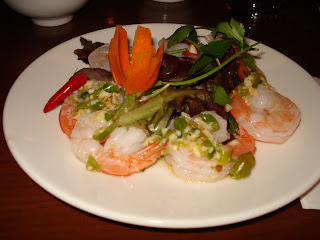 As usual, we were looking for spice in our Thai food, so we were drawn to the superwild shrimp, one of two menu items that warranted a triple asterix for heat. They weren’t kidding when they described these as lightly cooked, but they were kidding about the heat. Even my father, who complains about our ordering hot food, said there was no heat at all. This dish had potential, but failed to deliver. Again, a dish with potential that failed to deliver; these mushrooms were stuffed with a delicious combination of white prawns, water chestnuts, shitake mushrooms, garlic, and onions. It was even finished with a delectable choo chee sauce, but it was all based on a plain white button mushroom. White button mushrooms just might be the most boring ingredient a person could use. Why people continue to use them is beyond me. Bags of gold, you have to admit, it’s a much better name than fried wontons. 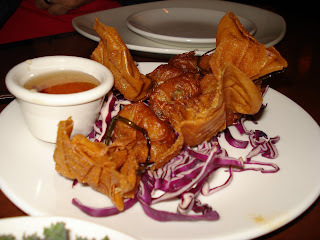 And like any fried wonton, these were pretty damn tasty, not too greasy. 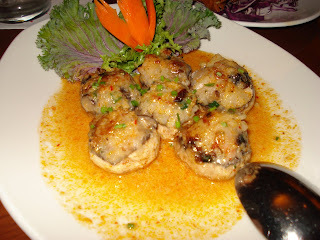 The stuffing was a mixture of shrimp, water chestnuts, and those goddamn white button mushrooms. 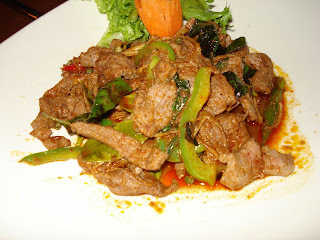 Nothing too spectacular about this dish, it was just your average Thai sirloin dish. There wasn’t any heat, and where was the curry taste? My advice, skip this and move on. 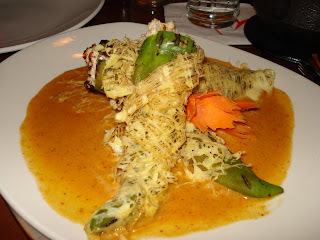 This dish of stuffed Anaheim chilies was very well done, except for the fried netting. I’m not sure what they were trying to accomplish, but it looks like fried gauze and quickly turned to a mush in the sauce. Once you got past the fried bit, the peppers were pleasantly roasted and stuffed with nicely spiced ground pork. 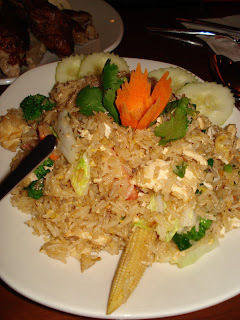 You can’t go wrong with carbo loading at dinner, but once I tried this, I went back to the bowl of white rice. Despite the large cuts of vegetables and ample chicken, this was just subpar fried rice. Five spice is one of those Asian condiments that everyone has seen, but is never really sure how to use. It was used very well on this duck. 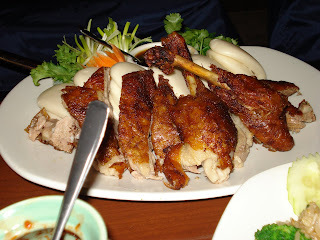 The duck was true to its name and was quite crispy, and very flavorful. Arguably the best dish at Typhoon. What would I say about this restaurant overall? Not bad for a neighborhood place, but not worth making a special trip. Sure, I’m biased as I previously mentioned, but there’s no such thing as a unbiased judge.